The Auburn University Spirit of Sustainability Awards program exists to recognize individuals or groups of Auburn University students, faculty, staff, and alumni that exemplify the Auburn spirit by making significant contributions toward sustainability on campus or in a community at any point along the Sustainability Compass: Nature, Economy, Society, Wellbeing. Nature undertakings exemplify how we can restore, protect, and live in accord with the laws of Nature. Economic achievements contribute to a prosperous economy that is viable, fair, and inclusive. Societal work cultivates connectedness, caring, equity, and engagement. Efforts for Wellbeing nurture individual health, fulfillment, happiness, and wellbeing. 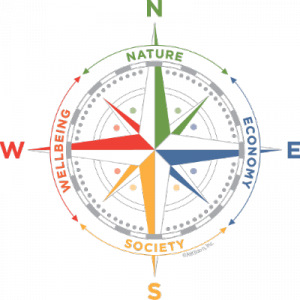 While all nominations echo various points of the Sustainability Compass, awardees are chosen based upon their motivation and commitment to sustainability; the impact of their work; and the degree to which they engage and involve others in their efforts. Nominations for the 2019 Spirit of Sustainability Awards have now closed. Recipients will be officially recognized at our awards ceremony on April 23, 2019. Nominations may be of an individual or a group, and self-nominations are welcome. We are privileged to honor these select recipients who are representative of the larger passion and commitment to sustainability that exists within the Auburn Family. Their stories serve as powerful reminders of the ability we each possess to help create a sustainable world. We honored the following recipients on April 20, 2017 at the Pavilion at Ag Heritage Park. You may learn a bit about their passion and efforts for sustainability below. We honored the following recipients on April 20, 2016 at the Pavilion at Ag Heritage Park. You may glimpse a bit about their passion and efforts for sustainability below. Will Olson, the namesake of the Student Achievement in Sustainability Award. 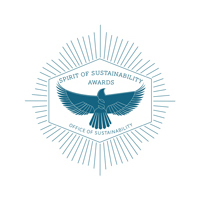 As a special part of the Spirit of Sustainability Awards, the William Olson Student Achievement Award has been created to recognize Auburn students who exemplify the same passion and commitment to sustainability as the award’s namesake, Auburn alumnus William K. Olson (1986 – 2012). This honor is bestowed annually to an Auburn student who embodies the same level of commitment to a sustainable future as Will. 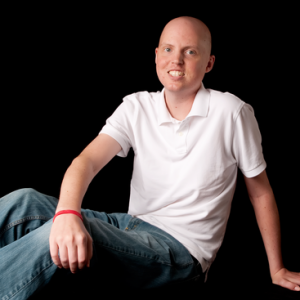 Having already battled brain cancer that first emerged when he was 14, Will started as an Auburn student in 2005. Although Will’s major was Chemical Engineering, Sustainability was his passion. An Honors student with a voracious intellectual appetite to learn about a range of sustainability topics, Will was involved as a Freshman with efforts that eventually created Auburn’s recycling program and was an Office of Sustainability intern in 2010. Will worked alongside his peers to advance sustainability in the Auburn community with humor, kindness, eloquence, and professionalism. He had the ability to move smoothly up and down the scale between fine detail and systems thinking, and brought a sense of the larger picture whether he was working on organic gardening, renewable energy, energy efficiency, alternative fuels, or waste reduction. Will’s passion for sustainability, determination in both thought and action, personal selflessness, and maturity beyond his years set a very high bar for what it means to be a student sustainability leader at Auburn University. Will graduated from Auburn in 2011 with a B.S. in Chemical Engineering and minors in Spanish and Sustainability. Will was working as an engineer and passionate sustainability practitioner when he died suddenly in May 2012 as a result of complications from his continuing 11 year battle with cancer. There is no doubt that Will would have continued to make significant contributions to the sustainable future he knew was possible, and would have expanded his role as a sustainability leader and role model for other Auburn students. Past recipients of this distinct honor have been Nathan Warner (2013), Sara Geonczy (2014), Jaimen Perez (2015), Rachael Gamlin (2016), and Hallie Nelson (2017). The Office of Sustainability would like to thank the following for their contributions to the Spirit of Sustainability Awards.